have their warrants exchanged at the closing for $1.00, comprised of $0.50 in cash and 0.05 of an ordinary share of Ascend Holdings. While I already had a position in the warrants (subtle brag) before this announcement I think that the warrants are today even more attractive than before for a merger arbitrage play. The value of the warrants has increased with 100% while the price has lagged and is up just ~70% (as of this moment). With the warrants at $0.60 you can make a whopping 66.7% return when the merger is completed. That’s a pretty insane return for a merger arbitrage. At the same time, the fact that the exchange proposal has been revised higher and to include an option for warrant holders to keep their warrants is probably a positive signal. The only reason for keeping your warrants is when you think that the surviving company will be worth a lot more than $10/share in the future. The warrants have a strike at $11.50 while they are callable when shares start trading at $24. While the possible return is very high this is also a deal that has more risk than your average merger arbitrage. When the merger isn’t completed the warrants are going to be worthless because in that case ROIQ will be wound-up and cash will be returned to shareholders. When you own a normal stock instead of warrants during a merger arbitrage your downside is usually a couple of dozen percent to something in the direction of the pre-deal price. Because of this I think that ROIQ warrants should offer a return that is roughly three or four times higher than a normal merger arbitrage, and the position should also be sized accordingly. But even when we adjust for the higher risk the deal appears to be very attractive. A 65% return divided by four is still more than 16%, and usually something like 4 or 5% is already a pretty big spread. The current spread is basically implying that the probability of this deal going through is just 60%, which I think is way too low. But perhaps I’m missing something? This entry was posted in Portfolio and tagged ROIQ, ROIQW on August 17, 2015 by Alpha Vulture. Very nice. How did you come across ROIQ and ROIQW in the first instance? Congrats on the bump to $1, but I would take the 60c and run. You’re missing the maximum redemption condition. Take a look at the major holders and add up how many are are arb funds that almost always redeem. This deal looks vulnerable. Thanks for the comment, I’m afraid that you may be right… thought with the stock price above >$10 for the past months that things would be alright. Wasn’t getting the arbs on board the reason for the change? If you look at the warrant holders they are the same arbs that hold the common. How do you see who holds the warrants? If you have Bloomberg you can probably check this without doing any work. @Packer: Yes, I now indeed think that the change was intended to convince arbs not to redeem their stock, but only the warrants. I’m not sure if I’m missing something but is there a maximum redemption clause for the warrants as well? I’ve only noticed the one for the stock. How did you get to the 18%? I read that they need to have at least $5M of net tangible assets, which would mean that upto 12M shares can be redeemed. the revision to the warrant indeed was an incentive to get some folks on board who are holding both stock + warrant. but will it work? i have seen combos that still failed on vote even with more incentive similar to this. i think you really need to bring in someone here and buy a ton of shares from these folks at a small bump. look at what happened the couple times the stock tried to run $10.20-$10.30’s post executed agreement announcement. it was sold down back to $10 almost immediately. if they don’t get rid of these holders some or allot are still going to vote no. doubling the warrant take out offer is not going to change their motivation, and mind you all with stock; cash amount is not changing. if we got a LEVY or Agrofresh type pop here where those initial arb folks were long gone i would be very bullish here. in my opinion this is still not a buy even with price tank today and you could get all you want to eat here at .40. there will be one more shake out. i will say this though — the delayed filing here on the vote is potentially a great sign from management. they might realize they have to bring in some 3rd party to buy out these original stock holders for a small premium. this takes time to set up. if you see this kind of filing or say even better there is an adjournment of the meeting in real time and it gets rescheduled, 99.9% of the time this gets a knee jerk reaction of run to the hills and the warrants will tank to .10 cent range. however reality is, these are the greatest setups you could hope for. that is when you come in fully loaded and buy as much as you can hand over fist because the deal will close 100% of the time. With the price at 10 or higher why wouldn’t the arbs sell the stock to someone @ 10 if they plan to redeem? There has been about 1.7 million shares traded since the original deal announcement presumably to folks who do not plan to redeem for 10.
think that number is higher now but still allot more shares out there. if i had to guess — i would guess that AQR Funds Diversified Arbitrage Fund would definitely be voting no. they have/had nearly 900K shares. anyone want to guess on Fir Tree? doing the math on a napkin looking like just under 7M shares of institutional holders … not including AQR above are in play here. even if trading volume at this point is over 2M, i don’t think that is enough to get rid of guaranteed no votes. think about it — it does not matter how they spike the warrants. these guys have no intent of staying long post combo on taking on that carrying cost risk of holding COMBO spac shares. you either get rid of them buy taking their shares away from them at a small premium or they vote no and get rid of their shares. What do the arbs gain by voting ‘No’.If they vote No, they will get $10 which they can now or through the redemption route if the Yes vote. On the other hand if they are also holding the warrants, they can gain more through warrants. I think everybody will be voting yes for this deal because you can vote yes and still redeem your shares. So the number of people who want to redeem is basically the true vote, if that number is too high the deal will fail. alphavulture makes a great point & that is the bottom line. i should have waited before i posted to completing my DD. this proposed combo is unique in this regard because the true vote is the number of shares redeemed. the warrants revision is a good tactic to get folks to hold onto to their shares. also this extension meeting that is happening friday is potentially another good strategic maneuver because it will give a peak or first look into the real vote next month. they need >65% yes to get the extension. another bit of info i found interesting — initially i was alarmed here at AQR fund’s big position and them being a lock for a redemption. however i noticed that they still have a massive position in the present Agrofresh post SPAC combo. keep in mind, they could have unloaded easily that whole position as Agrofresh pre SPAC pps exploded on hype because it had that DOW Chemical name attachment. but AQR did not sell their shares at all. i also found several other current ROIQ stake holders who presently own other SPACS post combo as well. combing through the filings you will notice they are authorized to do another 1M in private placement on top of that threshold for the 2.258M redeemed shares. one other tidbit is that most of the 2.2M shares that have traded post merger announcement will make the cutoff date for the vote. so you would think most of these share have a good probability of not redeeming since they were actively purchased in the open market. In nutshell, the merger goes through if the redemption is less than 3.25 shares. (2.25 m+1m private placement).If the redemption request is for more than 3.25 then the deal fails. it is not as simple as that. they can also bring in outside entities to scoop up shares like BlueBird had to do in order to get that combo pushed through. back in 2009-2010 they did this all the time as well. that 1M private placement restriction is on ROIQ itself. what happens in the open markets is a different story. there is also one other very unique clause/option that i stumbled upon in doing my DD that i will share in a few more days. surprisingly no one else is talking about this or has found it. in my opinion it will change the perspective and outlook of most on the prospects for this deal. OK so this is the deal. after combing through S1, merger filings and nearly everything i could find, this is not in there. but in a recent detailed filing release on the extension you will find explicit language (pasted below) that when all is said and done; Ascend still has the right to waive the 18% redemption requirement and still move forward in completing the COMBO. i have never seen this before in any proposed merger SPAC agreement. kudos to management for getting this in there. so when you factor in 2.258M + 1M private placement + Ascend still has option to close deal, the probability risk/reward scenario vastly changes in my opinion. Good find! Question is how much weight we should put on this statement. I don’t know. The special meeting to extend the date was supposed to held on Sep 18. I have not seen any filings from the company. Does anybody know the outcome of the meeting. vote extended deadline. but looks like 3.2M shares elected for redemption. however given the large arb presence here @ > 5M shares. if this is how it ultimately lands, better than what we thought. the other good thing is now with this extension until 10/15 vote, management has legit time to deal with this, talk with folks, and possibly drum up interest similar to how LEVY did it way before their vote. if ROIQ can just pick up one or even two new major holders + they have private placement option of 1M shares + Ascend can waive redemption clause all together and still consumate COMBO, the risk reward very appealing still here. warrants initially took off at open looking like .60’s on deck. but than a revised PR hit the waves detailing the specifics of the 3.2M shares and they are not trading basically back to where they were. NEW YORK, Oct. 12, 2015 /PRNewswire/ –ROI Acquisition Corp. II (“ROI”) (NASDAQ: ROIQ; ROIQW; ROIQU) and Ascend Telecom Holdings Limited (“Ascend Holdings”) today announced that they have agreed to amend the merger agreement (the “Merger Agreement”) relating to the business combination among ROI, Ascend Holdings and Ascend Telecom Infrastructure Private Limited, an independent owner and provider of passive telecommunications infrastructure on a shared, multi-tenancy basis for wireless telecommunications operators in India (“Ascend India”). Ascend India is currently majority-owned by subsidiaries of funds managed by New Silk Route Advisors, LP (“NSR”). The special meeting of stockholders of ROI to approve the business combination will be held on October 23, 2015, at 9:00 a.m. The pro forma enterprise value of Ascend India is reduced from approximately $335 million at $10 per share to $308 million at $10 per share. As a result, the number of ordinary shares of Ascend Holdings NSR will beneficially own at closing is reduced from 12.7 million to 11.2 million, excluding earnout shares. ROI’s sponsors will forfeit approximately 1.1 million ROI founder shares. As a result, the number of ordinary shares of Ascend Holdings ROI’s sponsors will beneficially own upon completion of the business combination is reduced from 2.3 million to 1.2 million, excluding earnout shares. Ascend Holdings may not repay the outstanding subordinated debt of an amount, as of March 31, 2015, equal to approximately INR 1,800 million (or approximately $28.89 million using an exchange rate of 1US$ = INR62.31, as of March 31, 2015) owed by Ascend India to IL&FS Financial Services Limited, an affiliate of Infrastructure Leasing and Financial Services Limited (“IL&FS”). The minimum cash amount which ROI is required to have to complete the transaction is reduced from approximately $103 million to approximately $71 million. At a pro forma enterprise value of $308 million, at $10 per share, the implied multiples are 10.8x projected fiscal 2016 EBITDA (ending March 31, 2016) and 8.9x projected fiscal 2017 EBITDA (ending March 31, 2017). Ascend Holdings’ comparable companies in India trade at 13.9x projected fiscal 2016 EBITDA (ending March 31, 2016) and 12.2x projected fiscal 2017 EBITDA (ending March 31, 2017). Ascend Holdings’ comparable companies in the U.S. trade at 18.8x projected calendar 2015 EBITDA and 17.3x projected calendar 2016 EBITDA. Sounds like they got a deal! Great news here, anyone electing to keep the warrants? I voted to get $0.50 and 0.05 shares. I think if you want to buy the shares, you will get an opportunity to buy them at <$10. I also think that that is likely. Ultimately it just depends on your risk tolerance. I agree we’ll trade under $10 after it closes, but also think there’s quite a bit of upside. Please clarify — anyone who has purchased warrants past the 9/18 record date. Have you received the election proposal form and been given the tender option of the .50 cash + .05 stock take out? Again this question is for anyone who purchased past 9/18 record date that could NOT vote their warrants on the merger proposal. I didn’t have an option to vote on the merger proposal, but no problem tendering my warrants. IB indicates in their corporate action tool that you can buy on 2015-10-19 and still tender. I agree on the upside. 4G is just starting to being rolled out in India. There will be new freq bands rolled out in India in near future. There is lot of potential of rent increases for Ascend’s towers. American tower is investing big time in India.Ascend could be a good buy for American tower . I believe the default option is the 50 cents and .05 stock. You had elect by 10/19 to have the warrants survive. During the period of September 8, 2015 to October 10, 2015, ROI and Ascend Holdings with the participation of Deutsche Bank Securities Inc. and Oppenheimer & Co., contacted and held meetings with certain existing and potential investors of ROI and Ascend Holdings with respect to the Business Combination, at which the parties received feedback on the terms of the Business Combination. Commencing on or about October 1, 2015, ROI and Ascend Holdings discussed the possibility of restructuring the Business Combination in light of feedback from meetings with certain existing and potential investors and due to recent economic turmoil in certain emerging markets. 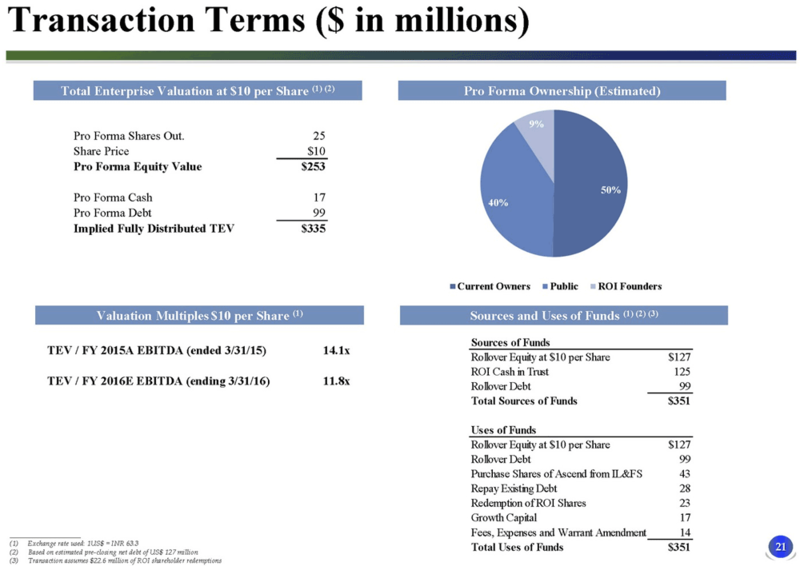 The parties discussed a potential reduction in the total pro forma total enterprise value of Ascend Holdings based on the number of Ascend Holdings ordinary shares outstanding as of closing of the Business Combination through either a reduction in the common stock to be held by NSR upon closing of the Business Combination or forfeitures and/or transfers of ROI founder shares or some combination of the foregoing. The parties also discussed removing the closing condition relating to the maximum redemption amount for ROI public shares in order to provide more flexibility for structuring the Business Combination. During this period, ROI’s management kept its board of directors apprised of these negotiations and discussions. Pursuant to these negotiations and based on feedback from existing and potential investors, on October 11, 2015, ROI and Ascend Holdings agreed that ROI’s sponsors would forfeit approximately 1.1 million founder shares at the closing of the Business Combination and that the number of Ascend Holdings ordinary shares that NSR would own upon the closing of the Business Combination would be reduced from approximately 12.7 million to approximately 11.2 million. The parties also agreed to remove the maximum redemption closing condition and the requirement that a portion of the proceeds of the Business Combination be used to repay certain subordinated debt of Ascend India that is owed to IFIN. — The revised merger terms follow feedback received from meetings with the current holders. Thus I think the chances of a positive vote/limited redemptions and the deal closing are materially higher than what the market seems to be pricing. Time for a new post reflecting on what happened?